Product #21800 | SKU ATH-M70X | 0.0 (no ratings yet) Thanks for your rating! 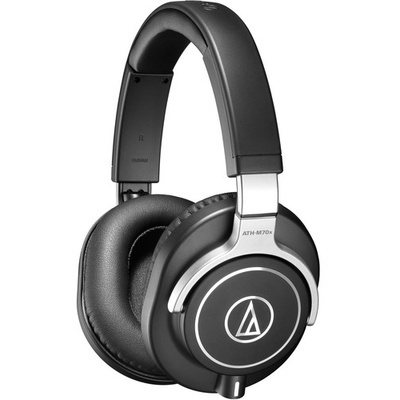 The Audio-Technica ATH-M70x Pro Monitor Headphones use proprietary 45mm large-aperture drivers with rare-earth neodymium magnets and copper-clad aluminium wire voice coils to deliver an extended frequency response of 5 to 40,000 Hz. Their closed-back circumaural design follows the contour of the ear to help isolate from environmental noise and makes them suitable for studio mixing, tracking, FOH, DJing, mastering, post-production, audio forensics, and personal listening. Crafted for lasting durability with a collapsible, space-saving design, they are equipped with 90 degree swivelling ear cups for easy, one-ear monitoring. The professional grade earpads and headband provide a comfortable fit and the three included detachable cables (one coiled and two straight) allow you to use the headphones in a variety of studio and mobile applications. They also come with a carrying case and a 1/4" (6.3 mm) screw-on adapter.